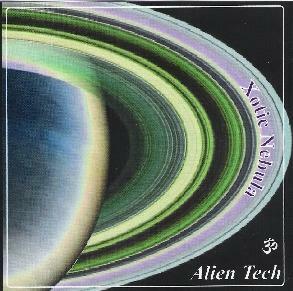 Alien Tech - "Xotic Nebula"
Here is another outing from Alien Tech, A.K.A Richard Wixner, who on the outset is an avid explorer of synthesized induced mind journeys. It starts off with the very heavy and throbbing 'Dance at Galaxy's Edge'. This track is possibly my favourite of the11 tracks on this CD, and I guess the reason for that is because it is heavy, throbbing, and lasts over 10 minutes! By heavy I mean the sound is harsh, somewhat distorted, and it hits you from the off with a strong emphasis on movement and focus. By throbbing I mean it is sort of relentless in its abuse of the senses, constant, and of a quick tempo. It is in the mould of Tangerine Dream, and it reminds me of a mix between Rubicon, Phaedra, and Maroubra Bay from Edgar Froese's classic solo album Epsilon In Malaysian Pale. The driving nature of this track however is left behind on the other tracks, as we venture into more melodic variations of electronic music. This is all part of the journey. There is a common feel of analogue, rather than digital, in the synthesizer sounds themselves. Whether they have been created by virtual software or not does not matter because the overall CD does not really divert from its initial purpose. And the sounds used seem to also be used throughout to good effect, rather than chopping and changing with each track. The constancy of the movements is very much aligned with one another. However, this is not to say that I like every track, nor every sound used. There are tracks that are too computer game sounding, in essence, for my liking, as with, 'Tropic Region'. This track could be likened to Tomita, and it sort of lumps along, if that makes any sense? I do not like Tomita for this fact, and I find that it is too classical sounding in construction of the melodies and chords involved. It lumps along… as in not graceful. Tomita is a good base for what most of Xotic Nebula sounds like. The CD is a lengthy 60 odd minutes and it could be said that it is a harsh distorted glimpse at sound. The CD itself is made up of 9 tracks under 5 minutes and 2 tracks over 10 minutes, so it is sort of short in its phases, and this to me is where it lacks. There are too many short atmospheres that do not really go anywhere, and on the whole it is rather a crazed journey. Again Tomita seems to be a good likeness. Overall, I loved 'Dance at Galaxy's Edge' because it moved with a sequence behind it. The rest of the tracks did not have such tempo, and no sequence, so did not move me as much. I guess that I love sequencer patterns more often than once, and I like atmospheres merged together into one whole rather than many short, often contrasting pieces. Regardless of this Alien Tech is out there doing what comes natural, as in using the creativity of mind to further explore the mind. To improvise whatever streams, and to adapt whatever suits. For more information you can visit the Another Planet Records web site at: http://www.anotherplanerecords.com.